Allstate Insurance and Posit Science, a San Francisco start-up, are looking into brain-training video games as a way to give drivers a discount on auto insurance. "I was thinking it was just like the (software) game," he said, remembering his near-miss. "I was looking straight ahead - I didn't expect this car on the left. I can't prove it, but I'm 100 percent convinced that if I hadn't taken the course, I would have been hit." 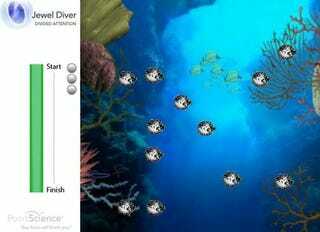 Jewel Diver is one of five "exercises" in a program called InSight, developed by Posit. The game asks players to focus on red jewels that are then hidden behind swimming fish. The goal is to keep your eye on the fish hiding the gems while a bunch of other identical fish swim around a coral reef. When the fish stop, the player has to click on the fish that contain the jewels. Posit says the game helps users improve visual processing, like divided attention and peripheral vision. According to SF Gate's article, Allstate is using the program with its over-50 drivers as an experiment. If the program shows results, Assistant Vice President in Research and Marketing Tom Warden says, they might use high scores in the software as a way to lower insurance premiums. The insurance company is still sifting through data from the experiment, which began in October, and is looking at ways to use the software. If it's shown to work with young people, for example, Allstate could use Posit to appeal to different age groups, Warden said.